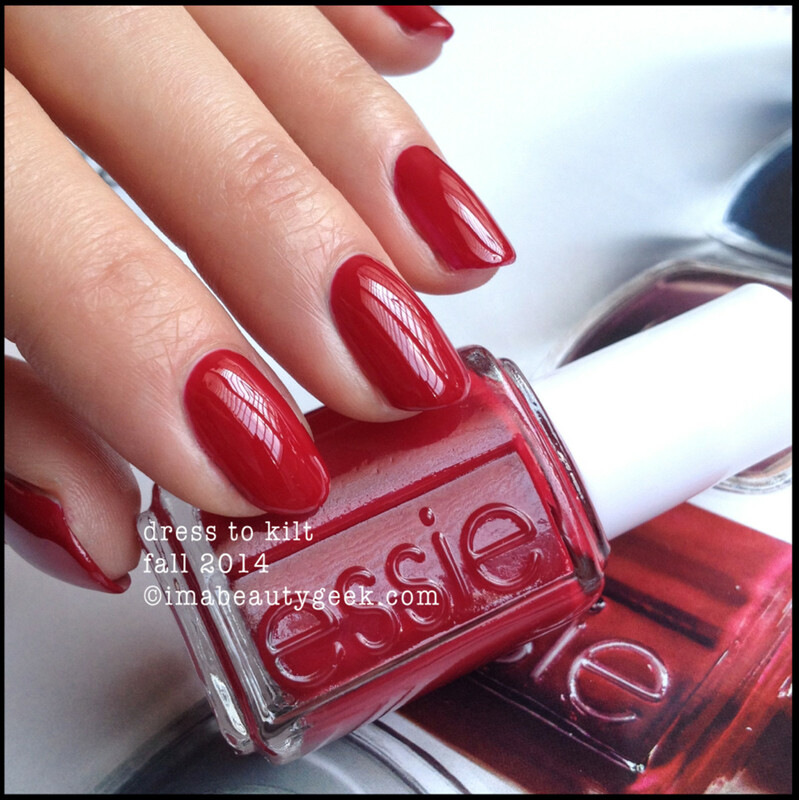 Essie’s fall 2014 release Dress to Kilt is just around the corner and I’m really just not ready for fall colours yet. (Are you?) My nail-painting pastime is tough! I have to be a season or two ahead of you in terms of colour -- in June, I was already knee-deep in the darker shades of Fall. Don’t get me wrong, I love the absolute simplicity of fall shades. But to me, they signal the end of summer. Luckily for the transition this year, Essie is wickedly shiny. Like, wickedly. 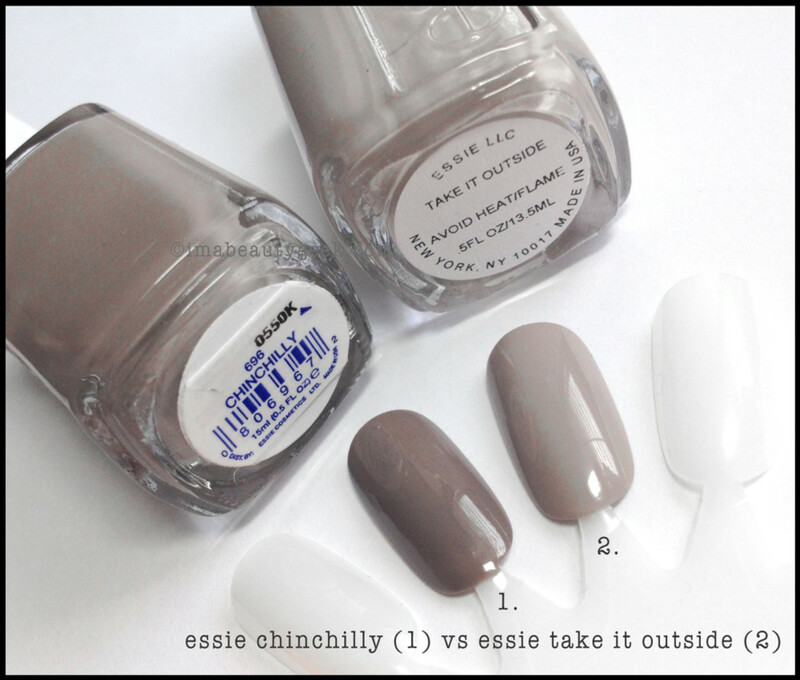 above: essie fall 2014 take it outside A beautifully light gray, almost pink-toned taupe that’ll ease you into the fall season. It’s awesomely shiny and awfully sophisticated in two easy coats. above: essie fall 2014 fall in line I love a camo-esque green. I do. I can’t help it. Essie calls it an “enigmatic jade” but I just call it a winner. There’s this sort of plasticized finish on all these shades that makes them incredibly shiny. That right there is two coats with no top coat. above: essie fall 2014 partner in crime Yes, it’s one of those deep mahogany shades you’ve come to expect from an Essie fall collection but this shiny? What?? I dunno what they’re stuffing into those bottles but I really can’t believe the shine. It’s amazeballz. 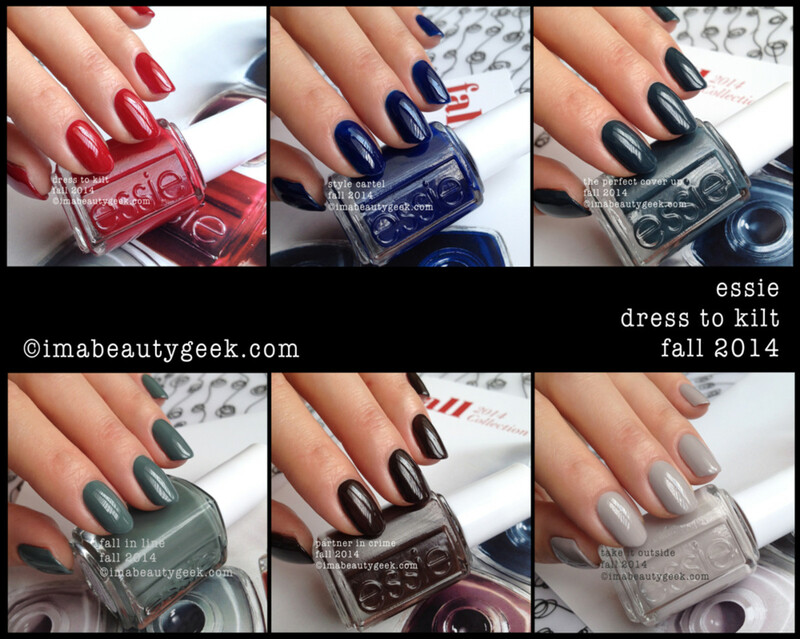 above: essie fall 2014 the perfect cover up Deep evergreen teal with a shot of grey. So bee-ooo-tiful. Again, that’s two coats. 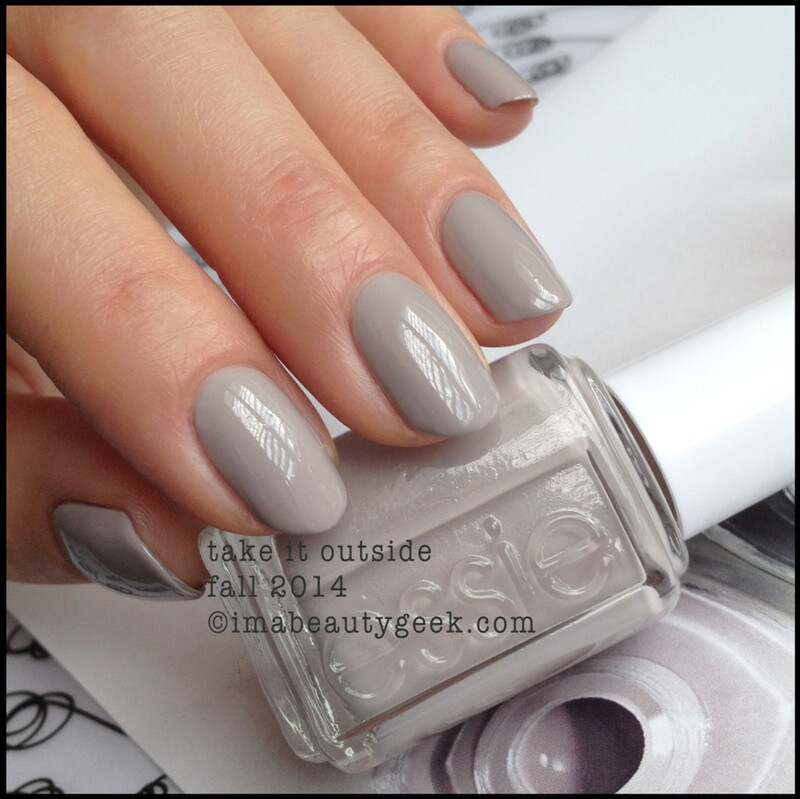 above: essie fall 2014 the perfect cover up with matte about you top coat Yes? No? What’s your vote? 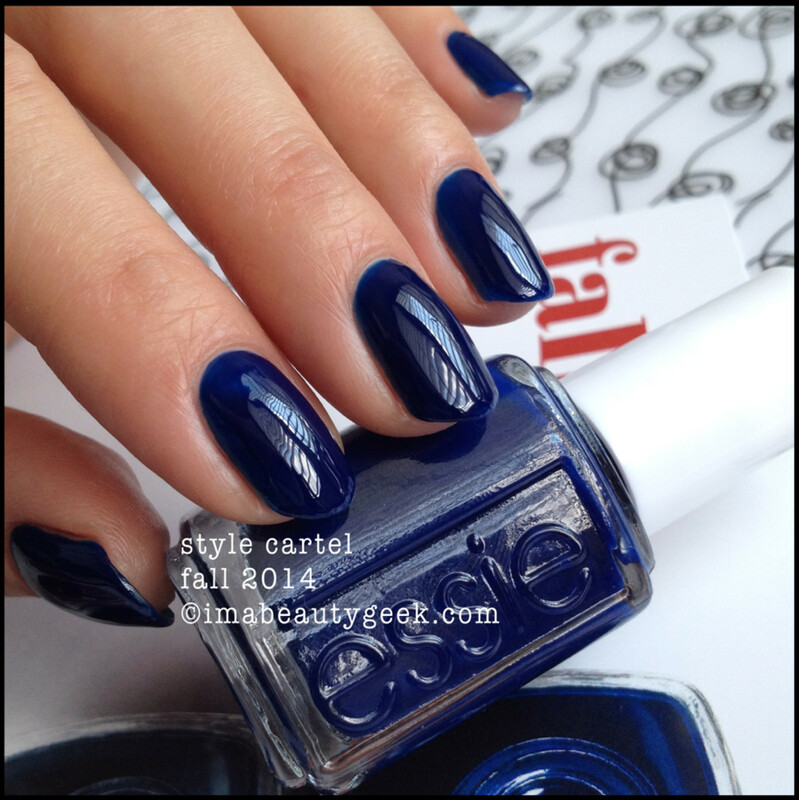 above: essie fall 2014 style cartel It’s a deep inky, indigo blue jelly that stopped me in my tracks. Again, two coats and look at that über-glossy finish! That’s no top coat. None. Dry time is average but that shine is magnificent. 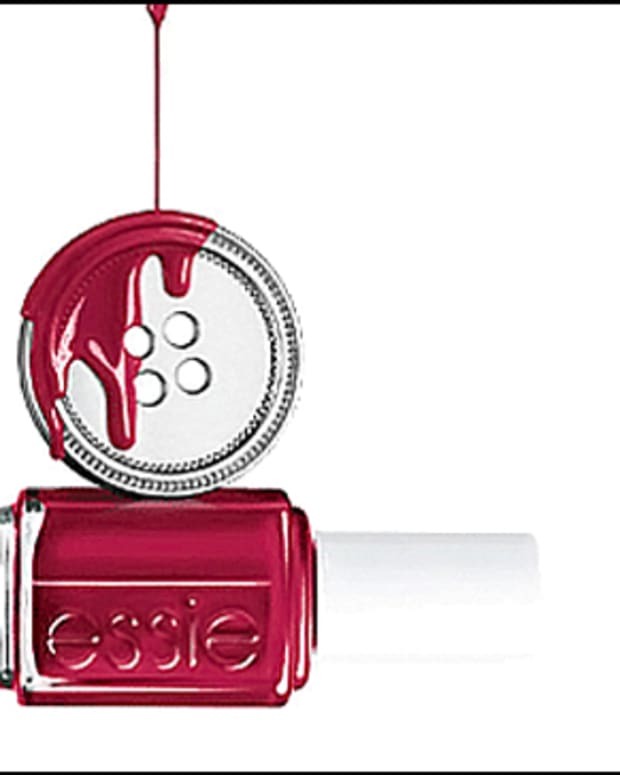 above: essie fall 2014 dress to kilt The namesake of the collection. Is it unique? 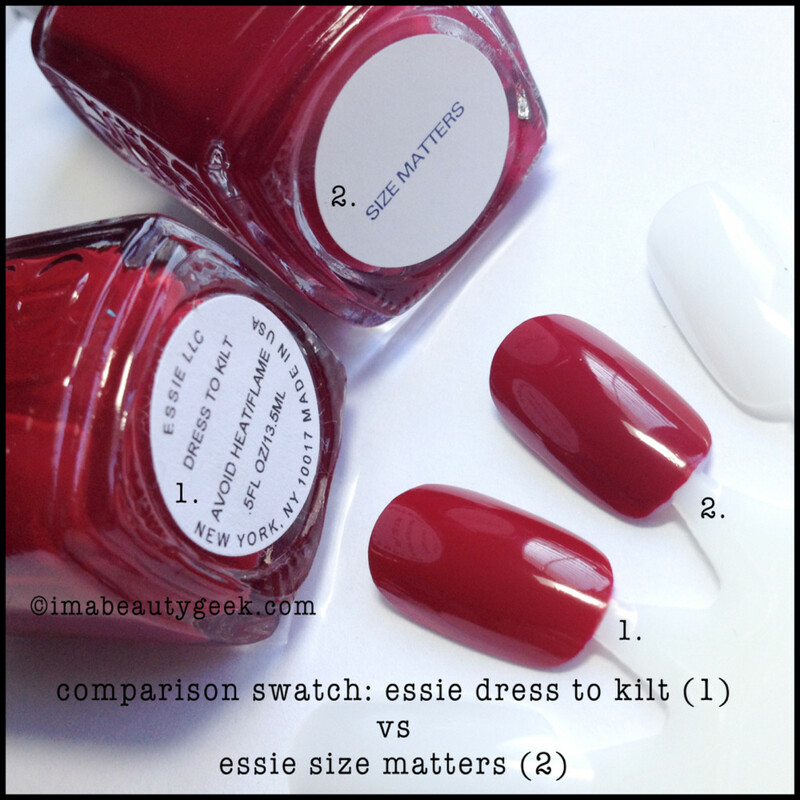 Nope – if you’ve got either Essie Twin Sweater Set or Essie Fishnet Stockings, you don’t need this one. Is it a one-coat wonder? Nope. Is it pretty and shiny? Yep. Will I keep it? You betcha. As I mentioned, I’m not sure what Essie has been stuffing in these bottles to achieve this level of shine but whatever it is has made the polish a bit thicker and a bit more bloopy for pushing around with that signature skinny, flexible brush. For a polish of this consistency, I’d prefer a wider brush that’s perhaps a touch less flexible. While the control issues aren’t terrible and the polish almost lends itself to being an OCW*, I ended up having to do two coats for each. For best results, I let each coat dry for a good four minutes before recoating. If you polish thick, you can 100% OCW all these shades. So, you gonna go get some? Huh? Guess what! I don&apos;t photoshop! Guess what else! I don&apos;t use a lightbox! Guess what else! I have blinds in front my windows and my desk is right in front of my windows! Guess what else! Shiny stuff has reflections. 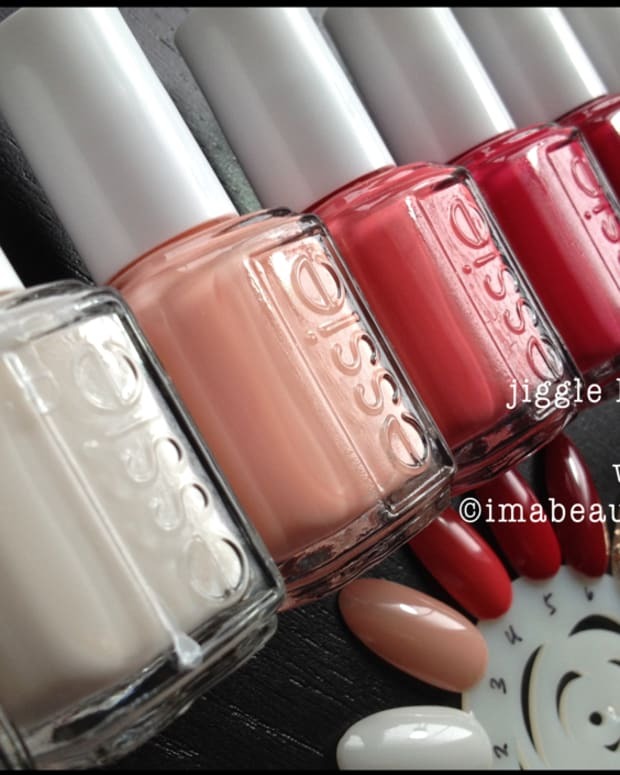 Essie’s fall 2014 palette Dress to Kilt ($10 CAD each bottle) will be available August 2014 all over the place. 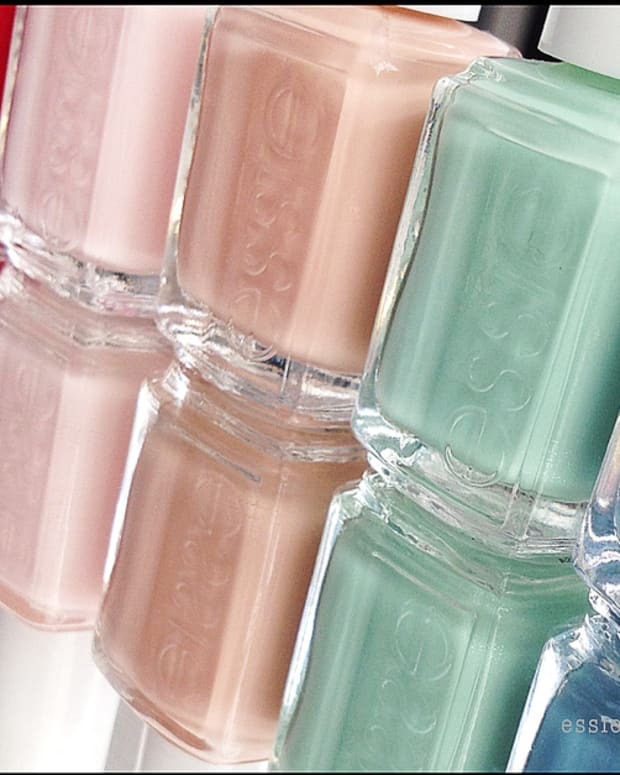 If you&apos;re looking for more Essie, you can hit Essie.ca. 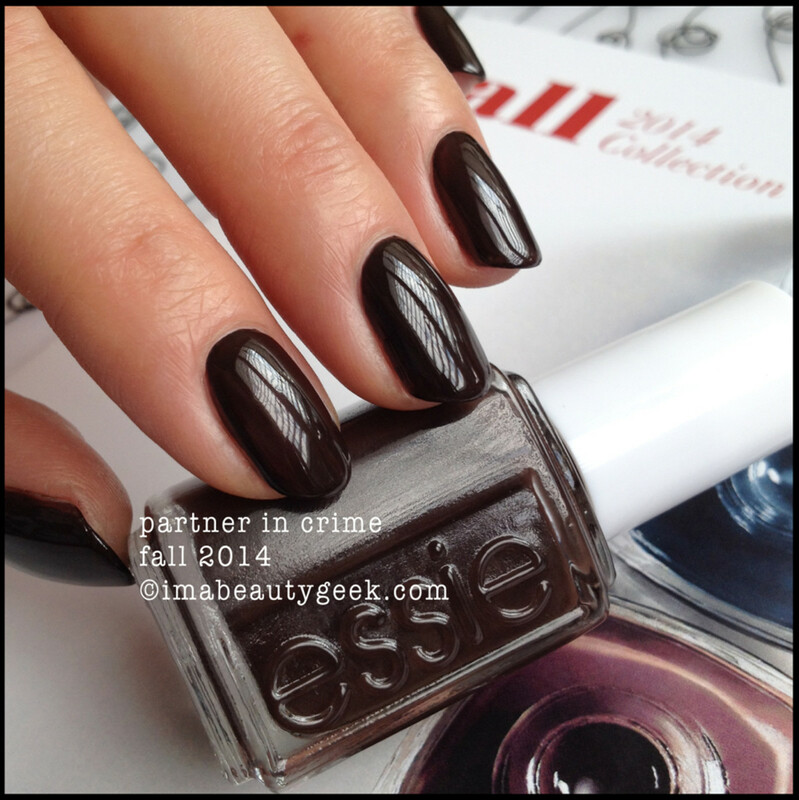 If you&apos;re looking for the Fall 2014 offering from OPI, it&apos;s in this here linky thing. And hey! Thanks for stopping by! This one&apos;s for you, Mayra! 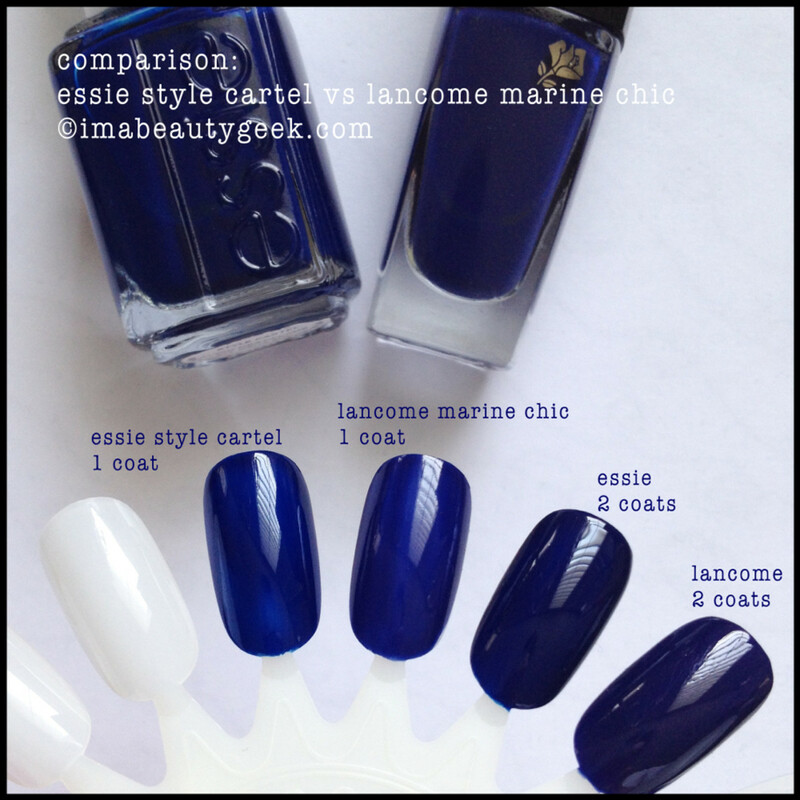 From right up close, Lancome is a tiny bit more dusty navy while Essie Style Cartel is a little bit more inky navy. After two coats (which you&apos;ll need for proper coverage), Essie comes out a hint more black than Lancome but after two coats, you need to look very carefully in the exact right light to see the difference. 98% similar. This one is for you, Lauren! I don&apos;t have Master Plan but I do have Chinchilly - hope it helps, lady! And this one is for you, Karen! So close... Size Matters is a couple shades darker but pretty close indeed!